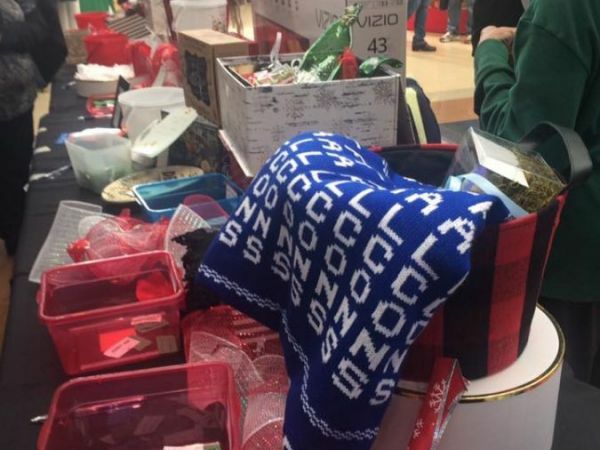 Local Holiday Bazaar was a Soaring Success | MacKellar Associates, Inc. This year was the beginning of what could very well have become the largest annual bazaar event in all of Rochester Hills and its neighboring communities -- with proceeds benefiting the Rochester High School Athletic Program(s). Event Coordinator, Patty Schattler, announced its 2nd Annual Holiday Bazaar which was held on Saturday, November 5th at the Rochester High School from 10am-5pm was a soaring success, bringing in over 1,250 guests! The holiday bazaar offered a truly unique shopping experience, bringing the shopper a day of cheer, music, and good eats! One-hundred, fifty-four vendors and artists participated, from all over Michigan and Ohio. The donations that were provided consisted of over 25 items ranging from a 43” HDTV, Calico Corner Gift Basket (value $350), Pine Tree Lighting Crystal Lamp (value $250), Green Leaf Salon & Spa Products (value $75), Falcons custom-made blanket by The Blanket Lady, a division of MacKellar Associates, Inc. (value $68), The Michigan Pedaler gift card (value $100), 4th Street Boutique gift card (value $50), and many, many more! MacKellar Associates, Inc., along with Huntington Ford were the two local businesses acting as sponsors. Hosting a toy drive for the Children’s Leukemia Foundation of Michigan, was MacKellar Associates, Inc. initiative. The CLF organization is near and dear to the hearts of the MacKellar family. It was encouraged to bring a new, unwrapped toy or gift card to benefit the families – which the community listened! In addition, MacKellar, along with Bird Bee, distributed a free Michigan gifts including a tee and an organic seed packet wristband to the first 200 shoppers! Although this free gift was promoted throughout the advertising campaign, the shoppers were absolutely thrilled to receive a gift as they entered the show. The “Stay Calm & Shop On” wristbands (embedded with wild flower seeds) were a hit! The shoppers were excited to plant their wristband to see how their garden grows come Spring and Summer…with the memories of a great shopping experience! The Michigan artists came from all facets of arts and crafts creations – from floral and knits to home décor and handbags! Samplings of Michigan-made eats from Heavenly Creations, Recipe Kit Warehouse, Pop Daddy Popcorn, Ned’s Pretzels, and even McClary Bros (flavored vinegars) from the ever so popular ABC show Shark Tank were just a few amongst the list of food vendors. Got music? The holiday bazaar did! The Rochester High School was bursting with musical fun to get you in the holiday spirit with performances from the band ensemble, a student pianist, as well as local Actor and Singer, Jennifer Kincer and friends. Mark your calendars on November 4, 2017 for the 3rd Annual Rochester High School Holiday Bazaar!